Recent release “Grandpa’s Bear Story” from Page Publishing author Gary Raley is a fascinating short story about a grandfather who suddenly noticed the biggest bear tracks he has ever seen while strolling along beside a mountain stream, deciding to have courage and follow the bear. Gary Raley, a grandfather who enjoys living in Bend, Oregon, and have fun adventures with his wife and grandchildren, has completed his new book “Grandpa’s Bear Story”: a remarkable short story on a grandfather’s experience of following big bear tracks even if he is nervous and afraid to meet a bear. if he eats lots of wild honey. Close by and could cause a danger to me. Published by New York City-based Page Publishing, Gary Raley’s riveting book teaches readers on the importance of being kind to animals as well as to be brave when fear is felt. This is a human-animal encounter adventure story that also shows the tension between caution and courage. 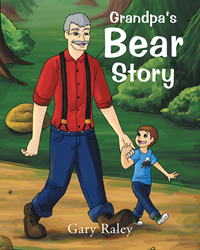 Readers who wish to experience this entertaining work can purchase “Grandpa’s Bear Story” at bookstores everywhere, or online at the Apple iTunes store, Amazon, Google Play, or Barnes and Noble.